Teachers are supposed to inspire the younger generation to follow their dreams and achieve great things. However, our hero, Nozomu is not that teacher. Nozomu's probably the most depressive man in Japan--so depressive, in fact, that every little setback in life inspires yet another suicide attempt! But then why is being in Nozomu's class such a blast? Is it his quirky and endearing students? The bizarre adventures he leads them on? Or is there something after all to "the Power of Negative Thinking"? 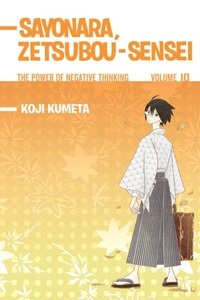 Speak Softly, And Carry Bad News Zetsubou-sensei and the students go on several unusual class trips, including an archaeological expedition, the Museum of Unnatural History, and Daisan Sentaku City-the city of the inexplicable third alternative. You know, like, when you're trying to decide whether to get a puppy or a kitten... and you end up with a crocodile? The students also practice selling themselves (legally), getting over their self-entitlement, and the art of "soft landings"-a.k.a. breaking bad news gently. Includes special extras after the story!